A delicious blush for sensational summer dancing. 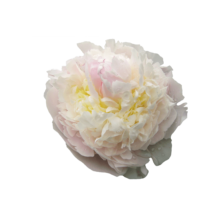 Paeonia Blush Queen with its pale pink color is a lascivious and summery appearance. Though the flowers are not large in the bud, they will open up easily and completely. This makes this flower the ideal bouquet peony who’s stealing the show in an inconspicuous way. Blush Queen is Dutch-made and was discovered in 1949 by breeder Hoogenboom. She had been forgotten for a long time until she started to make a furore with one of our growers in 2016. Her star is rising and her popularity is increasing. We can not predict the future but the expectations of this flower are great. Blush queen is an ideal replacement for other blush peonies such as Gardenia. Do you focus on summer bouquets in which the peony has a supporting role instead of stealing the main role? This is the peony you are looking for!